Cannabis and substance use-related behaviours, knowledge, attitudes, values, social norms and beliefs differ according to factors like gender, culture, geography, ethnicity, sexual orientation and stage in the life course. Cannabis-related outcomes are also shaped by the larger historical and social context related to different sub-populations. 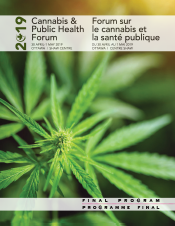 Research and policy approaches to the prevention of problematic cannabis use often do not account for the diverse identities within the Canadian population, which may create or perpetuate social and health inequities related to problematic cannabis use. During this session, panelists will discuss what is meant by taking a ‘public health approach’ that applies an ‘equity-focused lens’ to preventing problematic cannabis use. Through a series of moderated questions, panelists will be encouraged to illustrate the complexity and intersections of identities that must be accounted for when advancing research and policy related to the prevention of problematic cannabis use, and to highlight challenges and promising practices related to incorporating equity considerations into these research and policy activities. This session will provide public health professionals an opportunity to gain greater knowledge and skills to improve their potential to influence cannabis policy decision making. Participants will learn about the stages of healthy public policy making as they relate to specific cannabis policy examples, analyze some of the challenges and opportunities that arise when considering municipal cannabis policy options, and explore lessons learned in developing recommendations for decision makers encouraging a public health approach to provincial and municipal legislation and regulations. The Sensible Cannabis Education Toolkit, created by Canadian Students for Sensible Drug Policy (CSSDP), has been promoted across Canada as a pivotal and central resource for those looking to engage in evidence-based cannabis discussions. As our drug-related social contexts continue to shift and evolve, and as the reach of the Toolkit increases, there is a growing appetite to operationalize its key messages in a diversity of settings. The aims of this workshop are two-fold: 1) disseminating strategies for the integration of the Toolkit in a diversity of practical and applied settings and 2) soliciting conference participants’ expertise to gather feedback on how the reach and messaging of the Toolkit can further be improved in order to be applied across diverse contexts. Participants can expect to be both educators and learners in this highly interactive session, as we aim to utilize our collaborative efforts to inform the differing needs of youth across Canada. The symposium will present findings from the first wave of the International Cannabis Policy Study (ICPS). Presentations will focus on 1) cannabis prices and purchasing behaviours; 2) patterns of cannabis use and modes of use; 3) indicators of problematic use; and 4) illicit retail sources and cannabis prices before and after legalization. Presentations will examine differences between provinces at baseline, as well as comparisons to US states that have legalized non-medical cannabis. The symposium will discuss implications for specific cannabis policies and evaluating the impact of cannabis legalization in Canada. Participants will be able to use the information presented in the session to learn about the evolving cannabis market and key cannabis use indicators. Designing, implementing, evaluating and scaling- up novel public health-based interventions to address the unprecedented numbers of deaths resulting from opioid overdoses is an urgent priority in the United States and Canada. Preliminary findings from the United States have raised the possibility that cannabis might have a beneficial role to play in addressing the overdose crisis. In Vancouver, BC, researchers investigating the role of cannabis in the lives of people who use illicit drugs have found beneficial associations between cannabis use and the likelihood of some drug-related harms. Meanwhile, some community-led interventions are distributing cannabis in the hopes of preventing fatal overdoses in the Downtown Eastside area. M-J Milloy will outline the overdose crisis and describe cannabis as a possible harm reduction intervention, summarize preliminary findings to date on cannabis use among people at risk of overdose participating in three ongoing prospective cohorts of people who use illicit drugs in Vancouver, and describe both community-based and clinical research aiming to better understand cannabis as an intervention during a community-wide overdose crisis. Information learned in the session could be used to better understand overdose risk and the possible role of cannabis. The Canadian Coalition for Seniors' Mental Health (CCSMH) has been tasked by Health Canada to develop guidelines regarding four substance use disorders (SUDs) in older adults (opioids, cannabis, alcohol, and benzodiazepines). Interdisciplinary working groups collaboratively created guidelines using evidenced-based methods, including AGREE and GRADE. In this workshop, a brief overview of the issues facing older adults with, or at risk for CUD (Cannabis Use Disorder) will be presented through literature review. Next, the guideline recommendations for cannabis will be presented including prevention, screening, assessment and treatment. The presentation will conclude with remarks by panelists addressing the relevance of the guidelines for public health practice, policy and research. Participants will be encouraged to give feedback, and share their experience and ideas for knowledge translation. Physicians, nurse practitioners, counselors, psychologists, researchers, administrators, community senior mental health team members and others caring for older adults are among those encouraged to attend. This symposium will review the current state of evidence and on cannabis use pregnancy and breastfeeding women. Data on brain development suggest that prenatal exposure to cannabis may lead to subtle, persistent changes in brain function cognition, well-being and quality of life. These adverse outcomes are significant and it is imperative that healthcare providers have the training and resources to feel confident and competent providing care. Participants will emerge from this session recognizing their unique position to address the enormous gap in research on the safety of cannabis and should consider pursuing and supporting this research. As well, participants will receive guidance, tools and practical wisdom that can be used to effectively manage pregnant women who are consuming cannabis, to promote a healthy pregnancy for pregnant women and their babies. What Does the Future Hold for Cannabis Research in Canada? Having embarked on an historic transition – legalizing and regulating cannabis after almost 100 years of prohibition – has provided researchers, policy makers, health professionals and business with an equally historic task. Everyone is calling for more information on the impacts of cannabis use. To effectively address this challenge will require leadership and collaboration across jurisdictions, disciplines and sectors. This session will provide delegates the opportunity to be updated on the research agenda in the areas of mental health, public policy and basic science. Panelists will provide an overview of current and future research agendas and delegates will have the opportunity to reflect and provide comment.